Millet, while relatively new to me, has been around 10,000 years, and is a wonderful addition to a vegetarians kitchen. While not a complete protein, like quinoa, unlike quinoa, one of the advantages millet has is it’s price, which is roughly about 1/3 of the price of quinoa. As much as I love a good vegetarian burger (especially these quinoa burgers), I had come across a number of millet burger recipes, and was keen to try my hand at making my own. 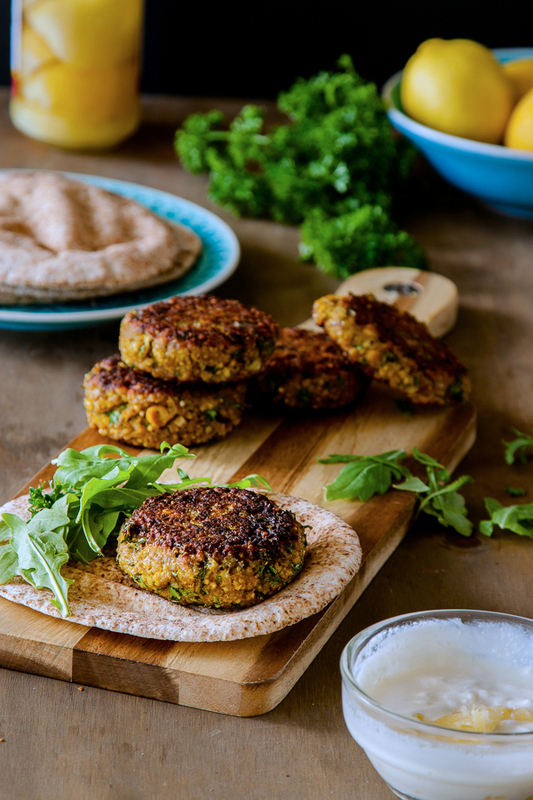 For these Spiced Millet and Chickpea Burgers I delved into the spice cupboard and used a lovely and fragrant combination of ground turmeric, cumin, coriander, and cinnamon. My favourite way to eat these pretty golden millet and chickpea vegetarian burgers is topped with preserved lemon yoghurt, rocket and fried onions on top of pita bread. They are also wonderful sans bread, served with a salad on the side. 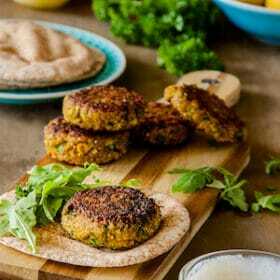 For these Spiced Millet and Chickpea Burgers I delved into the spice cupboard and used a lovely and fragrant combination of ground turmeric, cumin, coriander, and cinnamon. Add the millet to a saucepan over a medium heat and toast for 4 to 5 minutes, or until it smells toasty and the millet starts to turn golden. Add the water and salt and stir well and bring to a boil. Cover and reduce the heat to low and cook for 15 minutes. Remove from the heat and stand for 10 minutes before fluffing up with a fork. Allow the millet to cool completely before making the burgers. Meanwhile, place a frying pan over a medium low heat, and add the olive oil and turmeric, coriander, cumin and cinnamon and fry the onion until the onion is softened and the spices fragrant. Set aside to cool. Combine the millet, onion, garlic, herbs, lemon juice, preserved lemon, soy, chickpeas and breadcrumbs in a large bowl. Check the seasoning of the mix and add salt and pepper to taste. Add the eggs and mix well. Form the mixture into burgers (the mixture should make roughly 6) and place on a plate, cover with plastic wrap and refrigerate for 2 hours. Place a large frying pan over a medium heat and add the olive oil and cook the burgers on 3 to 4 minutes on each side, until golden. To make the lemon yoghurt place the yoghurt in a bowl and add the preserved lemon rind and lemon juice and whisk to combine. Serve on pita bread with fried onions, rocket and the lemon yoghurt or the accompaniments of your choice. While millet is gluten free, I've used breadcrumbs in this recipe to help bind things together, however you could easily substitute your favourite gluten free flour to make them gluten free. Tried these today and they were great! And the lemon yogurt with them was perfect. I couldn’t get mine to keep patty shape, but I didn’t mind a bit. Definitely making again especially with all the wonderful herbs and spices in them. Thanks! I’m surprised no one mentioned the preserved lemon rind. I’ve never seen any to buy in Australia so wondering what I can sub for this please, would you use lemon zest? Made this recipe tonight with mixed results. The flavor profile is spot on. Only half the patties held shape though. Definitely learned the hard way that tall and thick will hold shape better than thin and large. Would appreciate more photos/description on what the consistency the mixture should be just before making the patties: think mine were too wet. Also, would appreciate more details about successful frying. Despite the mixed results, I would give this recipe another go and hope for complete success. Really enjoyed the texture too. Hey Jennifer, your recipe looks delicious which I’m absolutely going to try. But I’m confused on the chickpeas. Are they in their dry form, or soaked? Hi Eva 😀 I’ve used soaked chickpeas here. You could also use tinned, however I would suggest rinsing them first. Let me know how you get on with the recipe. I love millet, and anything with chickpeas definitely has my name all over it! These look delicious Jennifer! I’ve tried millet a couple of times and don’t think I quite got the cooking time right, it was a bit too fluffy for my liking. I love how you’ve used it in these burgers – great quinoa alternative! 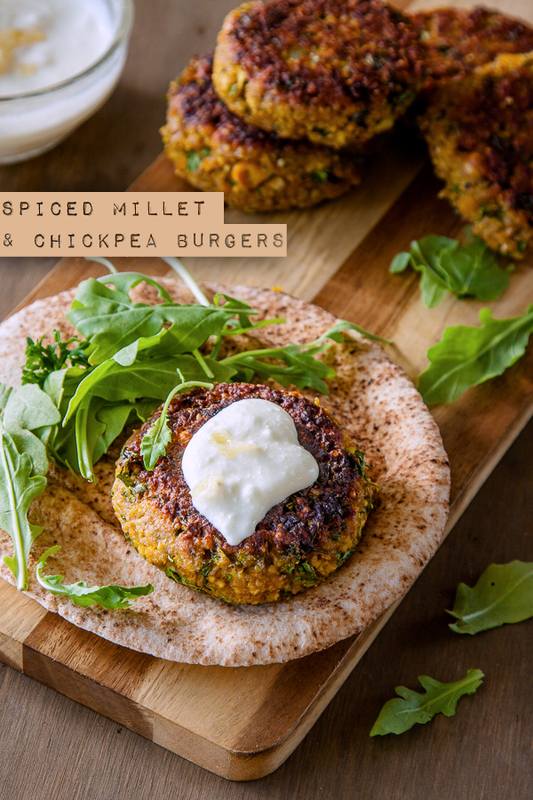 I haven’t tried millet but these burgers look so good (they remind me of falafel). Love the lemon yoghurt! 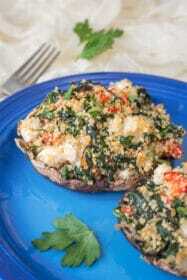 Beautiful photo and delicious recipe! Mmmm! I LOVE the look of these burgers, such a tasty combo of flavours. I’ve got a packet of millet in the cupboard that I’ve not yet played with, these may just be their time to come out and shine! Scrumptious! Vegetarian burgers of this kind are always mighty delicious. Great recipe. Lovely! This reminds me of a hearty falafel…I haven’t cooked enough with millet, and I must remedy that! I’ve been wanting to cook with millet for ages, but hadn’t found any inspiring recipes. Now I have – thank you! Enjoy Cybele. 🙂 Let me know what you think.